I looked up at the pillar, considering it in its entirety for the first time. I turned to Alex. “It’s not quite how I imagined it…. it looks longer…. and steeper…” Little then did I know how prescient these words would prove. 30 minutes later we were at the foot of the pillar and gearing up. The hot summer weather had opened up the bergschrund at the pillar’s base, making access to the normal start difficult. We therefore opted to start on a small ledge to the left, spying what we thought was a potential line of weakness. As we were starting off-route, we didn’t really know how hard the climbing above would be. Thankfully the climbing was not particularly difficult, proving to be more intimidating than hard. This was just as as well as hanging around at the base of the route wasn’t a great idea. As the morning sun crept over the horizon, it began to melt the snow and ice that bonded together the loose rock in the nearby Supercouloir. 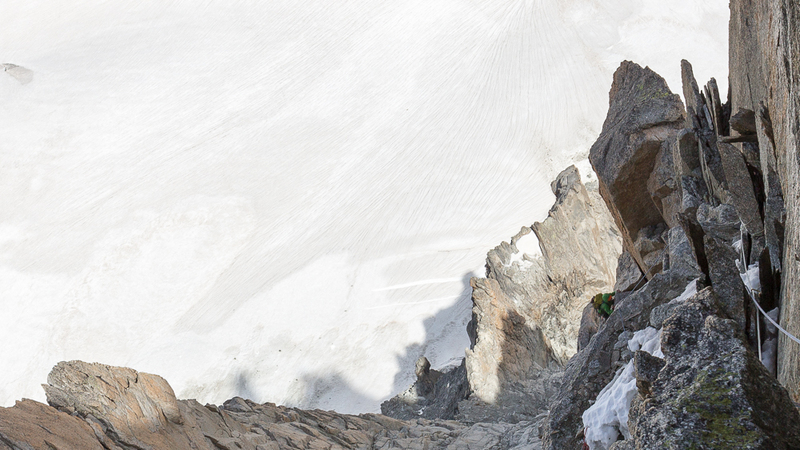 As the ice melted, rocks began to fly down the couloir and straight towards us. The distinctive high pitch whine of falling rock was utterly terrifying. Each time a rock came loose we would hear the whine start off faint and quiet before increasing in pitch and volume as the rock picked up speed and came ever closer. All we could do was hug the wall and hope the rock would miss us. Thankfully we escaped any direct hits. It will be a while though before I forget being peppered with shrapnel after a rock collided with the pillar and exploded a few metres to my side. Not fun! A couple of pitches up and we were relieved to get onto the pillar’s north side and out of the firing line. With stress levels subsiding a bit, we started to enjoy the climbing. A great pitch involving a few bold slab moves, a chimney and a steep crack brought us to some easier ground which we quickly moved up to the base of an incredible corner. 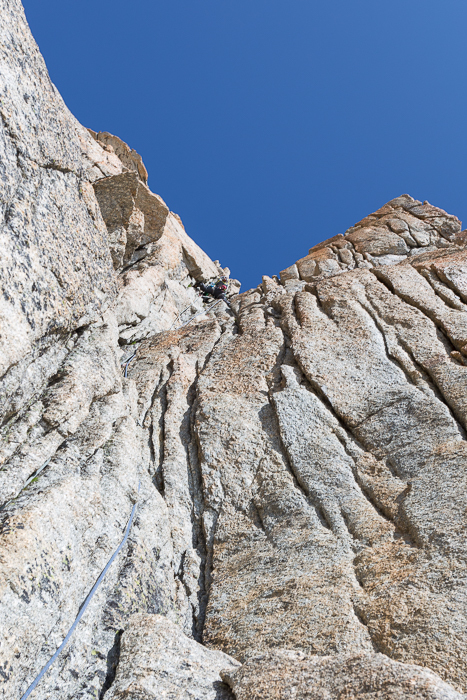 Climbing this corner in two long pitches, it was as good as 5b/c climbing gets – steep, but solid holds on perfect clean-cut granite that took bomber gear. Emerging to the base of an aid section, we were pleased to have gained back some time after burning through a lot on the first few pitches. Aiding from peg to peg we made our way up this section and after some easy but exposed climbing on the pillar’s north side we reached the top of a pinnacle. 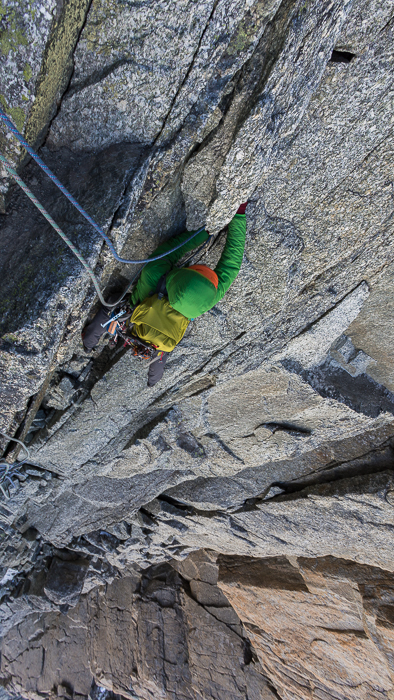 A short rappel led to a large ledge and another incredible chimney with more sustained climbing on exceptionally good rock. 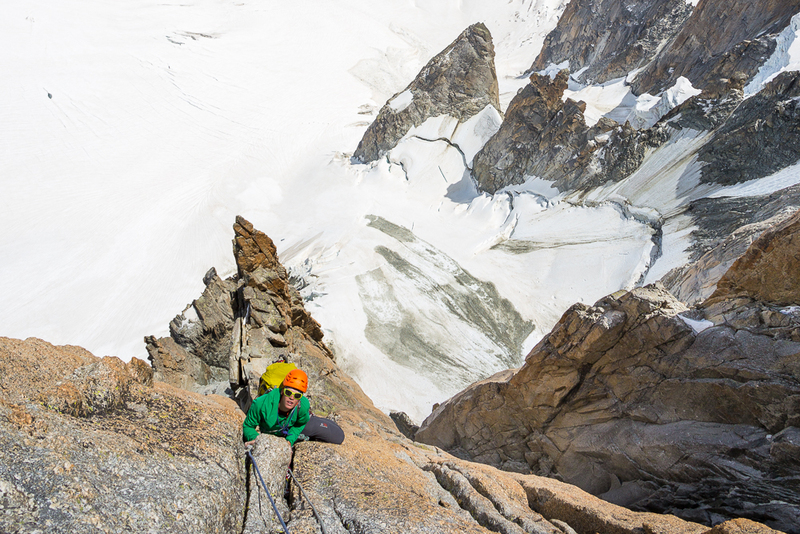 At the top of the chimney, Alex took over the gear and led us back onto the north side via some short but tricky walls. At the next belay, we checked the topo. Though the glacier was far below us and it felt like we’d been climbing for ages, we were probably only just over half way up the route. A few easy pitches up some loose ledges took us to the base of another fun chimney (theme here? ), which we climbed to a little brèche. Alex eventually suggested that an improbable looking chimney opposite us might be the way to go. The chimney was the first thing we spotted, but we had both immediately discarded it. It looked horrible – vertical and filled with ice and loose rock. However, short of a long retreat it seemed our only option. I made a rappel down to the base of the chimney and realised that the chimney was less imposing than it looked from afar. Alex took over the lead and opted to climb the face to the left of the chimney. Though the climbing was harder, it avoided the ice. 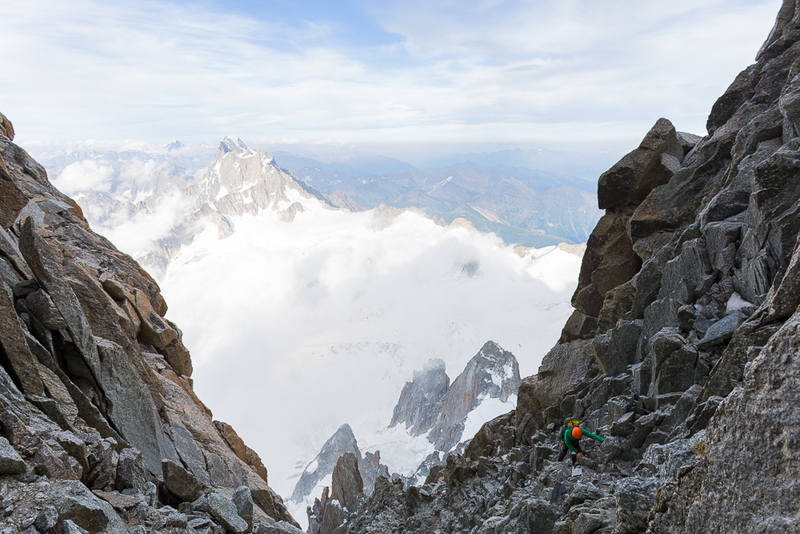 Once at the top we saw the exit couloir straight ahead of us and knew we were back on track. After tucking into the last of my food, we put away one of our two ropes and started to move together over the easier ground. Though happy to be able to move together after 700m of pitched climbing, the couloir was completely dry and filled with loose rock. Each hold was suspect and any rock dislodged by the leader would fly straight towards the second. Carefully trying to find a line amongst the choss we made our way up the couloir. 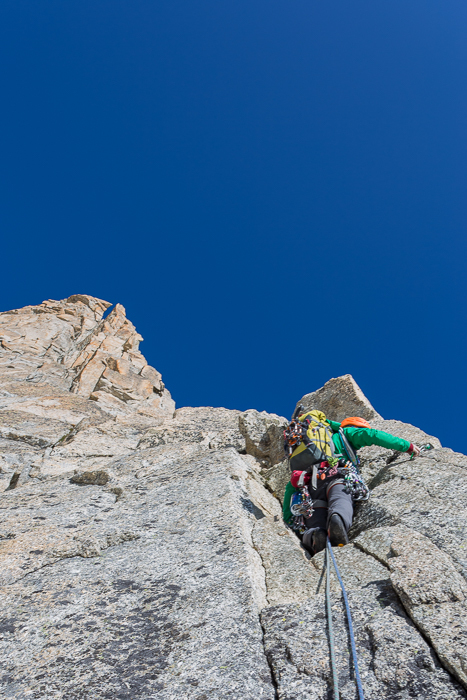 As we reached the top of the couloir the walls around us began to steepen and we realised that there would be a proper pitch of climbing to exit the couloir and gain the summit ridge. I opted to take a line up a chimney on the far left. Awkward and loose, I instantly regretted this decision. After a thrutchy battle I exited the chimney and reached the ridge. I brought Alex up and confidently told him that a short, easy section along the ridge would take us to the summit of the Tacul. In 15 minutes we would be standing on the summit. Putting away our rock shoes, we donned mountaineering boots and scrambled up more loose rock towards the summit. 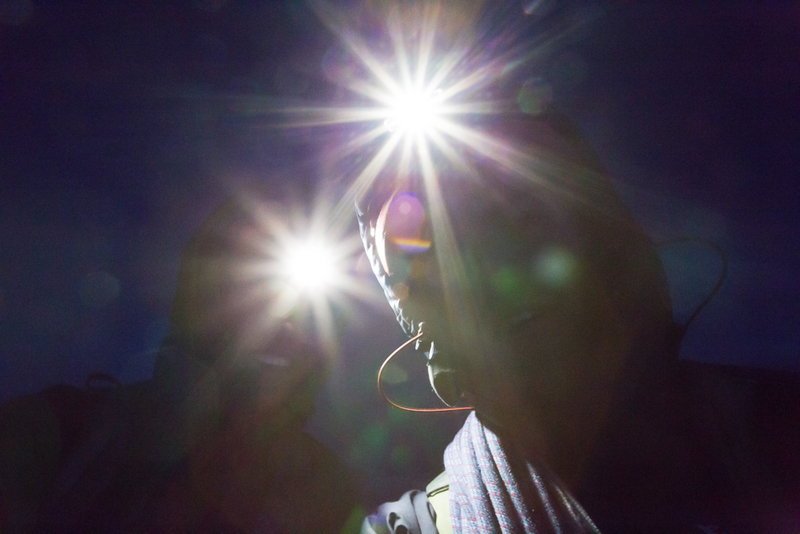 As I neared the Tacul’s east summit I shouted down to Alex that we were just 10m from the top. We were both psyched to see the end of this route after more than 12 hours on the go. Problem was, I was wrong about this being the summit. As I reached what I thought was the summit I realised that there was in fact still a fair bit of climbing to go. Relaying this information to Alex, his face gave a perfect pictorial definition of “for f***s sake”. Some more ridge work brought us to the base of what I hoped was the final section of pitched climbing. We didn’t know how hard the climbing ahead would be, but it looked exposed and potentially difficult. I was glad to hand over the gear to Alex but at the same time not excited to be belaying as the sun dipped below the horizon and a strong north wind started to blow. At least the view was good! Alex set off. After some swift climbing at the beginning his pace started to slow. I didn’t know what he faced but the swearing suggested it wasn’t fun. After a long wait with no sign of movement I heard Alex shout “safe!”. Great! Alex had successfully traversed the ridge and we were now almost surely just a few minutes from the summit. Then I heard Alex shout again. “The rope’s stuck.” After a moment’s thought, I yelled back “what do you mean the rope’s stuck? !”, realising the stupidity of the question at the same time as I asked it. “I can’t get the rope to move. It’s jammed and I can’t free it. I’m safe but I can’t belay you.” Realising my options were fairly limited, I simply attached myself to the rope with a tibloc (a sort of progress capture device) and started to carefully climb my way up, hoping that if I fell that the tibloc might limit the length of the fall. After 20m I reached the jam and managed to free the rope, only to then get a loop of rope that had been dangling around my legs caught in a crack below me. Carefully down-climbing, I freed the rope and shouted to Alex to pull in the slack and get me on belay. After climbing back up, a few delicate slab moves brought me to Alex. By now we were both well and truly over the route and just wanted to be finished with it. We weren’t quite at the summit, but it looked close. Taking the gear, I skirted around Alex’s left and 20m later made a belay. After a few celebratory shouts I yelled to Alex that I was sure we were finally at the Tacul’s east summit. Alex quickly climbed over and joined me. There was little in the way of celebration, just relief to have finished the route. 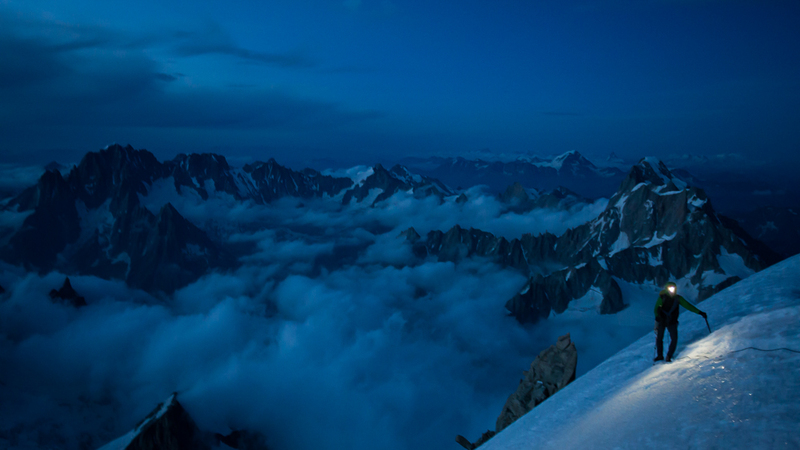 A quick and easy snow traverse led us to the true summit of Mont Blanc du Tacul. Here we tried, not too successfully, to get a summit photo. A bit of sketchy down-climbing on rotten ice brought us to the Tacul’s normal route, which we descended to our bivouac. Arriving at the bivouac hungry, thirsty and frankly pretty broken, never had I been so pleased to find the simple comforts of some water, a sleeping bag and a pack of Carrefour discount biscuits! For those interested in climbing the route I decided to write up a detailed topo. When looking for a topo we found the existing ones out there were pretty flawed in places. No doubt mine is too, so use it at your own risk! Or don’t use it all. An authentic experience on the pillar should have at least one moment when you think you’re at the top only to be cruelly surprised! 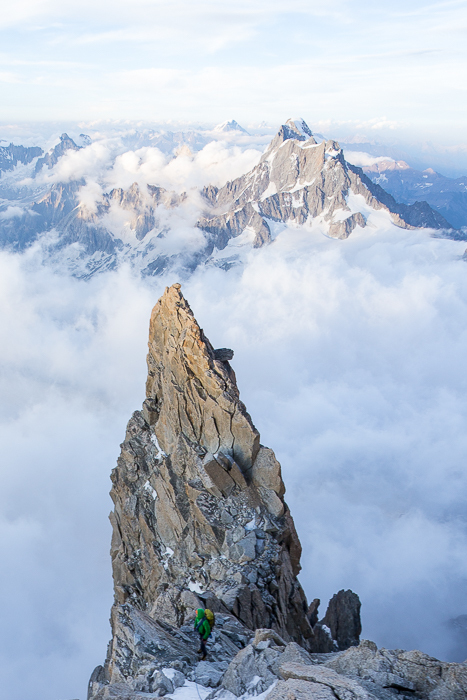 Arrive at the base of Mont Blanc du Tacul’s east summit. 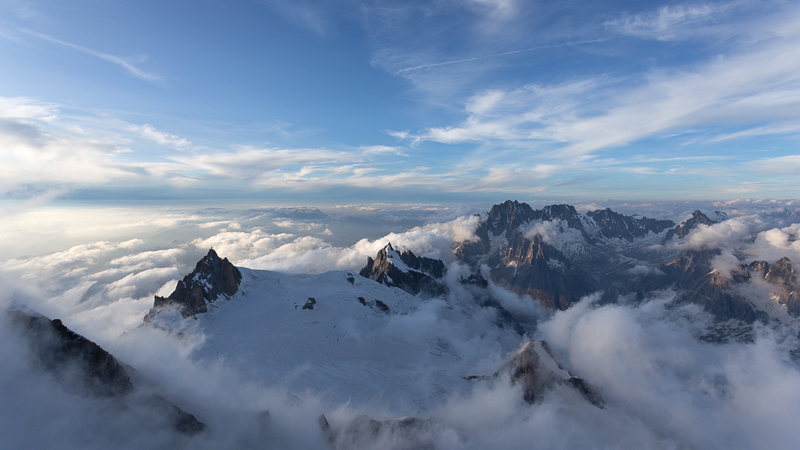 Move over snow along ridge to the true summit of Mont Blanc du Tacul! Note: we climbed using 60m half ropes. This enabled us to link up many pitches. 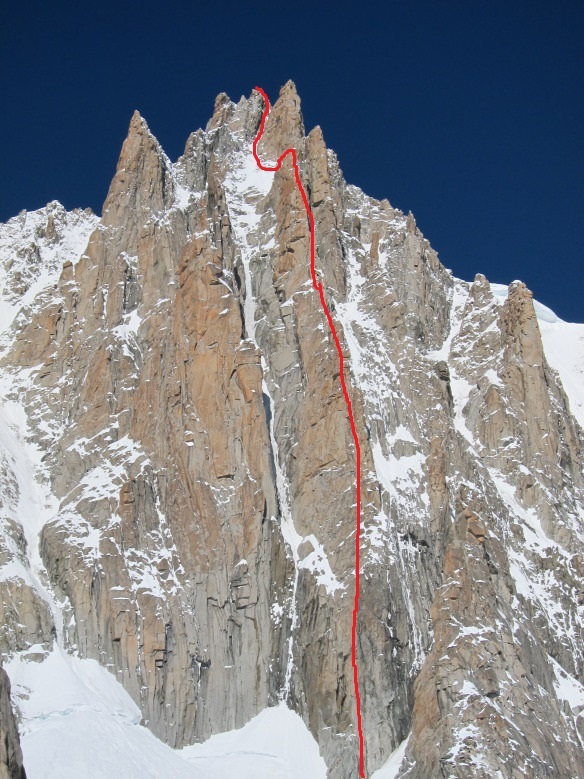 This would have been far more difficult with 50m ropes (in-situ belays are often located exactly 30m apart).